Our community is undergoing huge economic and cultural transitions - and Tony T. Smith want to serve his community by representing them in the Assembly so that all Nevadans, not just the few, realize the benefits of these changes. The people of District 4 deserve to have a representative willing to think big to confront the issues facing our community. This is why Tony is proposing a package of legislation and community initiatives that will give every Nevadan the Honest Deal they deserve. Click here to learn how Tony plans to make sure honest work results in honest pay. A key part of the Honest Deal is ensuring that Nevada has an economy that is resilient and innovative enough to benefit everyone well into the 21st century. For example, in the coming decades as many as 2/3 of the current jobs in Las Vegas are expected to become automated. Assembly District 4 deserves a representative that will fight to create a strong economy for our community in the short-term and the long-term. Tony is proposing legislation that will ensure anyone working full-time earns wages sufficient to live on and to save for the future. Tony also proposes a comprehensive reform of Nevada's administrative code to make it easier for people to work in professions such as cosmetology, landscaping, and other trades. He also wants to increase funding for infrastructure projects to bring more high-paying jobs to our community. Click below to learn how Tony plans to work with the community to build an economy that works for every Nevadan. Click here to learn more about the fight against big money in politics. It is clear Big Money in politics is poison to our democracy, preventing the people's voice from being expressed. That is why Tony is proposing the toughest campaign finance legislation in the nation. 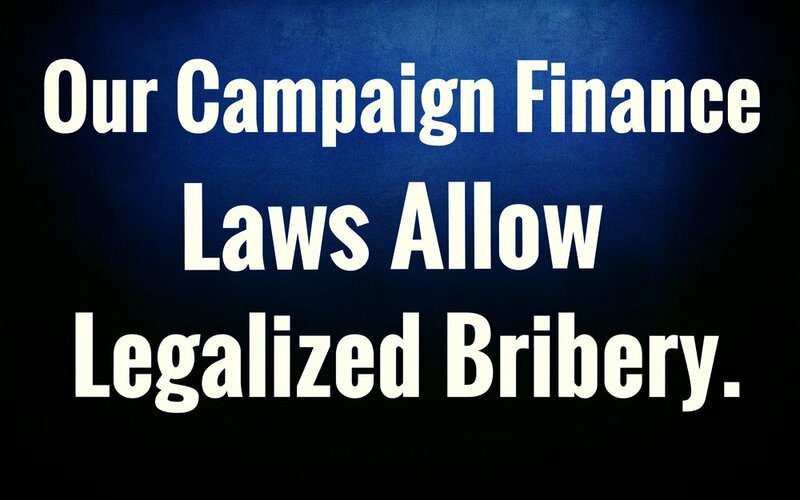 The goal of this legislation is to restore the people's voice by limiting candidate donations and by mandating stringent disclosure requirements for political action committees spending dark money on behalf of candidates. In order to practice what he preaches, Tony is refusing any donations over $250 so he is free to act solely in the interests of the people of Assembly District 4. Click here to learn how Tony plans to improve our education system. Not only is higher education a right in the 21st century, it is crucial to having a competitive economy and to coping with increased automation. Tony will fight to ensure debt-free higher education is a reality in Nevada. Learn more about how Tony plans to guarantee this essential right for all Nevadans. Tony T. Smith will work to invest in our public education system so that our schools meet the needs of every child. This includes increasing magnet schools in our community, allowing teachers flexibility to accommodate the different ways children learn, and allowing experimentation with innovative ways to teach, such as using community gardens to teach science and nutrition. Tony also wants to ensure civic education is a focus through all grades - our children need to be equipped with the tools to fully participate in our republic. Click here to get in touch with organizations improving our community! Tony believes elected representatives have an obligation to seek solutions from inside and outside of government to solve the problems facing our community. This is why Tony is actively involved in working with local nonprofits, faith leaders, and businesses to create the best solutions for District 4 and for our city as a whole. Tony is advocating a "Civil Society Restoration Initiative," which seeks to strengthen the civic bonds that keep our democracy strong. Click here to learn how Tony plans to protect our environment well into the 21st century. As Las Vegans, we must prepare as climate change threatens our supply of water and requires us to plan for more unpredictable weather in the future. This is why Tony wants to join several other States in creating an Adaptation Plan to ensure Nevada has an environment that can weather the challenges of this century. Tony will work with Nevada's federal delegation to renegotiate the Colorado River Compact, which allocates Nevada's share of water from the River, to ensure that Nevada receives its fair share. Tony will also will fight to bring down the cost of energy in our State, which will not only protect our environment but also our economy. Finally, Tony will do everything possible to prevent Nevada's Yucca Mountain from serving as the nation's nuclear waste dump. Click here to learn how Tony plans to watch out for our veterans and active military. Tony is committed to ensuring Nevada's veterans and active duty members of our military receive an Honest Deal. Tony proposes an expansion of funding for the Nevada Office of Military Assistance to provide free legal services to veterans and active duty military. He also will fight to expand programs offered by the Nevada Department of Veteran's Services to facilitate entrepreneurship opportunities for veterans. Finally, Tony will push to update Nevada's custody laws to account for the effects of PTSD on those that have served our country to ensure our State's veterans can maintain strong bonds with their children. Click here to learn how Tony plans to protect Nevada and the best parts of what America stands for. Tony is committed to creating a united Nevada by protecting the rights and dignity of all. This fight is even more critical with the Trump Administration openly advocating bigoted and unconstitutional policies all while attacking our healthcare and economic opportunities. Tony has been fighting to protect the rights and dignity of Nevadans since days after the election - now he wants to take the fight to Carson City where we can pass legislation to counteract the dangerous policies coming out of Washington, D.C.
Click here to learn how Tony plans to protect your access to information and privacy. Tony believes current legal and Constitutional provisions are inadequate to protect our fundamental rights to privacy and to an open Internet. This is why Tony is proposing legislation to prohibit your Internet Service Provider from charging you more to access certain websites, which will protect the free flow of information and the ability of small businesses to innovate. Tony is also proposing legislation to make sure you have the final say over how your private information is used, no matter how it is gathered. Click here to tell Tony what is on your mind. Tony believes the job of an elected representative is to listen and communicate with constituents to create solutions that will improve our community. This is why he is dedicated to engaging with every resident of District 4 o we can find the best way forward as a community.